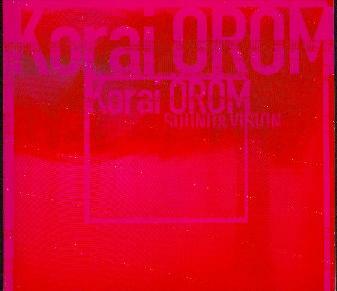 Korai Öröm - "Sound and Vision"
This is the first release of new material from the band since 1998! A long time to wait. The CD contains three high quality videos and 6 tracks (50 minutes) of new improvised music. The video tracks are all excellent and you have a choice of Pentium 1, 2 or 3. There is one video called Garazsvarazs, which is a very funky song with the camera following members of the band around until they all show up at the rehearsal space and have a little jam. The 2nd video is a black and white video of a naked women dancing. The track is ok. The last video is superb and really makes me want to see this band live. You can really see the incredible visual show that the band has. As for the new music, the first track on the CD starts slow and is very middle eastern in some ways and a little reggae as well, but around the half way point the track really takes off. The band is mixing a lot more weird synth and sampled sounds on the songs on this CD. The next track is mainly a repetitive keyboard line that slowly builds and some layers of Pink Floyd like guitar appears towards the end and some whispered vocals as well. Track 3, untitled of course, is a kind of dancy number with a lot of drums that the band did not quite know where to go with and it ends at 3 minutes. I think the new guitar player is much more into reggae and perhaps African music as many of the songs have this sort of playing style. Track 4 reminds a bit of Ole Lukkøye from Russia and is a long building song that ends mostly as drums. Track 5 is a very repetitive dub reggae weirdness track with scratching and some dub vocals. Track 6 is a very nice laid back song with some nice horns and synths and a good vibe. It is quite clear the band is experimenting with some good and not so good results. But overall, a very enjoyable CD. For more information you can visit Korai Öröm at their web site.